At age 8, Aidan needed to have surgery. When he came in for craniosacral therapy, he was walking with his hip locked, a result of fear around his recent surgery. He started talking all about the unusual animals he knew, making their sounds and sharing their zoological profiles. During the session, he talked and moved his legs as he needed to, sometimes even shaking fear off. At times he and his mother discussed the hospital experience and his friendships. As he talked, I worked on his leg, sacrum, and his head and helped him move out of being frozen in fear into fuller, more relaxed movements. By the time he got down from the massage table, he crawled around on the floor with my cat, and when it was time to leave he ran out the door to the car. When an emotional event, including a surgery, can be fully experienced in the body, the stuck fear is released. 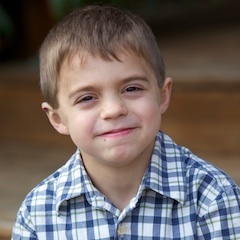 The CranioSacral session initiated subtle movements that allowed him to process his experience the way a normal 8 yo would: actively, connecting it to his life and the animal knowledge that captivated him. His mother and I made a way for him to bring all parts of himself to the session, meeting him where he was, not tying him down to a rigid treatment protocol. Aidan's mother says, "It is a comfort knowing that I have a place to bring my children that will work with their bodies to heal their problems rather than quickly reaching for a pharmaceutical solution." She could relax and help him heal in the session. Parent involvement in a child's healing is crucial, especially when dealing with a situation as disempowering as going to the hospital for any reason. Not only did Aidan's limp "disappear almost entirely after one session," but he felt more comfortable being himself, home again in his own body.